Since 1900, we have spent as much time fighting a war on drugs as we spent fighting wars in foreign countries. 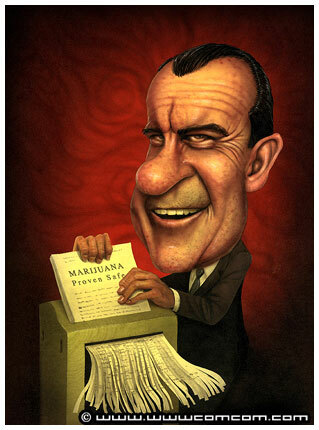 Richard Nixon’s Hopeless War on Drugs. On this 40th Anniversary of the “War on (Certain American Citizens Using Non-Pharmaceutical, Non-Alcoholic, Tobacco-Free) Drugs”, I decided for our podcast I would delve deep into the Nixon White House Tapes (available at http://nixontapes.org) with some help from transcripts provided by Common Sense for Drug Policy. Visit http://stash.norml.org/nixontapes to read and hear the rest of our audio chronology of the War on Drugs and the Shafer Report that first called for decriminalization of marijuana in 1972. ‘NORML@40’ is a retrospective video series that documents the trials, tribulations, and accomplishments of America’s marijuana consumer lobby from those who kept the movement going for the past four decades. In this episode, founder and legal counsel Keith Stroup looks back on the first years of NORML and how the National Commission on Marijuana and Drug Abuse provided him with a clear mission. Subscribe to NORMLtv, visit NORML’s Facebook page, and follow NORMLtv on Twitter for announcements and polls regarding future NORMLtv programming. Click here to vote for which ‘Ask NORML’ topic you want to see premiere this Friday.